The practice of student recognition can be a very powerful influence on building school spirit. In a school where recognition and affirmation flow between teachers and support staff, principals and teachers, and teachers to students, a more friendly and comfortable learning environment will result where individuals are treating one another with courtesy and respect. Student recognition can take on a life of its own. A whole new stage of improvement in school spirit occurs when teachers, staff and students are invited, enabled, and encouraged to recognize others in their work. This in turn models and promotes student-to-student recognition and positive self-talk. To build momentum in student recognition, begin recognition in small, yet meaningful practices. Student recognition can happen on a daily, weekly or monthly basis. Some classrooms may decide to implement a Special Student of the day award certificate. At the end of the day, the teacher selects one student who displayed an improvement in classroom behavior or helped another student with a difficult assignment. The student gets to select a piece of candy, Milestone charm, or sticker as his/her award. Similar programs can be expanded to occur weekly, monthly or even annually when award winners are nominated by their classmates. To make student recognition effective, the individual awarding the honor should verbally explain how the student recognition was earned. This will reinforce the behavior in the individual child and model desired attitudes for the entire classroom. Student recognition is an important part of a child’s educational experience. It will create a school culture where the child feel nurtured and valued. By recognizing and modeling desired behaviors, a culture of courtesy and respect will grow. This will help school spirit as all students will feel like a part of a team. The great thing about Employee Appreciation Day is that it includes everyone. Use a few of these welcome ideas to welcome employees! 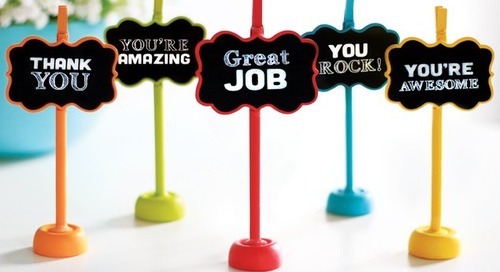 Help make employees feel appreciated with one of these 33 recognition quotes! Write them on a certificate, trophy, or greeting card! Our Top Five Retirement Gifts will Make Your Celebration Memorable! We are here to help you make it memorable! Easy Genie: Are You Too Busy to Give Employee Recognition? We have three quick and easy tips that will help maximize your time! Fun Genie: Do You Want to Have More Participation in Company Events? Get great ideas on how to increase participation here! Ask the Genie: Are You Unsure What to Give? We have plenty of useful gifts your employees are sure to love! Teamwork Genie: Do You Need Help Getting Managers' Buy-In? Give your managers the tools to excel at employee recognition! Happy Genie: Are You Struggling to Treat Everyone Fairly? Follow these tips to recognize fairly. Thanks Genie: Do You Want Your Team to Feel Appreciated? Forget one-size-fits-all; say thanks 100 different ways! Award Genie: Do You Need Tips on How to Present Awards? Presenting awards is one of the most important part of recognition! How-to Genie: Are You Unsure How to Recognize Your Team? Recognition doesn't have to be hard! Value Genie: Do You Need to get Buy-In from Company Leadership? Here are some great, yet simple tips to get you started. Dollar Genie: Do You have a Limited Budget? Increase morale, even on a shrinking budget! Serious Fun, Good-Humored Gratitude, & Purposeful Engagement. Use these tips to generate purposeful engagement! Ideas Happen: Ten New Resources to Help with Your Recognition Goals! Find solutions to the pain points in your organization! Here are some great ideas to get you started. Celebrate employee milestones with ease! Give gifts that your nurses will love! Celebrate Random Acts of Kindness Week with these 42 no cost ideas! A Perfect Gift for Every Team Member: Baudville's Custom T-shirts! Company t-shirts are a great team gift that will please everyone. Our top manager recognition tools and ideas are shared!